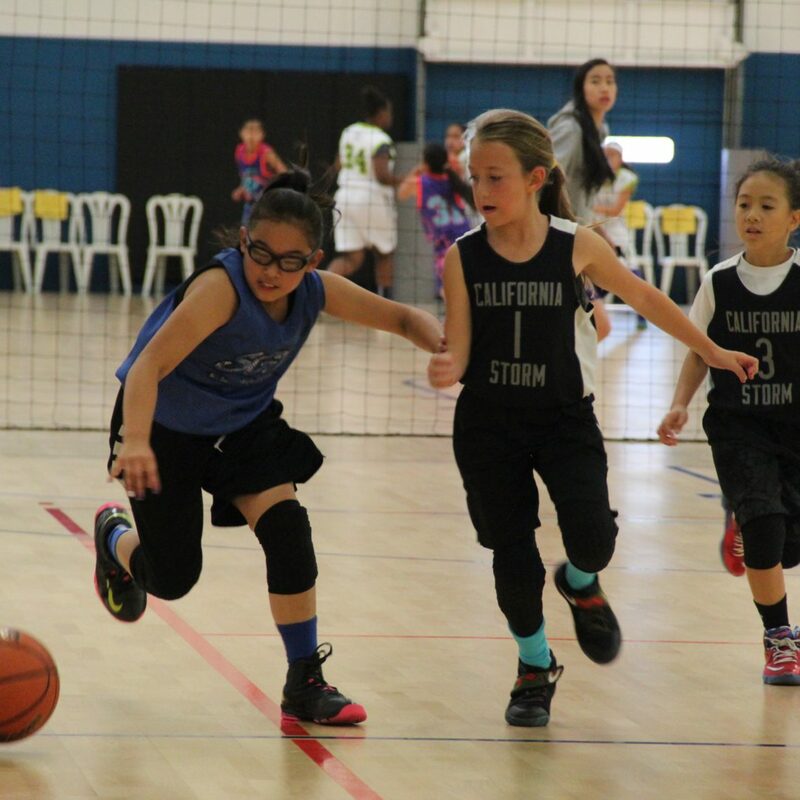 Held at Saddleback Valley Sports complex, parents and fans of basketball were treated to an action packed weekend that drew teams from as far away as Hawaii and Arizona. Teams in their final preparation for the heavy July coaches viewing period, brought out their finest. The tournament also drew the interest of several Division 2, 3 and NAIA schools hoping to get that early commitment or at least faces to watch over the summer. Some of the familiar teams made their appearances and several new teams in their inaugural debut. This tournament featured several buzzer beater and overtime games as the teams went toe to toe. This division had a bunch of entertaining games. The rising stars scrambling and diving on the floor to gain possession for their teams was fun to watch. Dream Chasers and So Cal Select were the class of this division but they had to fight their way to the championship as the each had some hard fought battles. In the Championship game, the Dream Chasers jumped out to an early lead, but the scrappy and tenacious So Cal Select came storming back. With time running out, Dream Chaser's Elle Stone came up big once again and hit the winning shot propelling the The Dream Chasers to the title over a very good So Cal Select team. A division that highlighted a new face to the tournament, 24/7 from Clovis, CA. They dominated their side of bracket play with excellence of execution. They are a well-coached team and play hard. The division game of the tournament was between Cal Storm Lightning and SGV as the Lightning were able to hit a runner as time ran out to send the sidelines into bedlam. Cal Storm could not maintain the momentum as TVT a familiar face came out on top of the other bracket with a convincing win of the host team. The matchup between TVT and 24/7 making it up a match of old and new. The class of this division lay strictly in the hand of the Wolfpack lead by their Coach Terrell Lewis. They have come a long way since the start of the year and looked really good in this tournament. They easily handled all corners and played tremendous defense giving up a game high of 16 points to a tough Cal Storm Thunder team. They earned and deserved to be the champions as they were clearly the best of the division. Okay so I know it is cliché to say but sometimes there are no losers in a game, but in this case two teams that were making their debut gave us the game of the tournament. Just when you thought it was over and there was no way either team could come back, just like the Phoenix rising from the ashes they did. Newcomer 808 from Hawaii and East Bay Tigers thrilled the gym with a double overtime game. A battle for the ages that garnered the best game of the Tournament. While that pitched war was happening on one side, Hidden Exposure Stars took care of their end of the deal to setup a championship game between two teams worthy of being called champions. In the championship game, East Bay Tigers depth and speed created issues for the hard-nosed Hidden Exposure Stars. The Stars fought valiantly and kept the game close before the East Bay Tigers were able to secure the victory. This division was dominated by two teams. One a familiar name in SOPAC who came ready to play and just took care of business. They were pushed hard in their game against a vastly improved Wolfpack Blue team, but managed to outlast the resilient Wolfpack to make the final. In the other pool, the sheer size and strength of the East Bay Tigers 8 controlled their pool and made the teams have to deal with their pressing and punishing style of play. This made the final a match up David and Goliath. As the championship game started the East Bay Tigers imposed their will on the outsized SOPAC. After a quick timeout, SOPAC was able to able to right the ship and used their outside shooting and ball movement to turn the tide and pull away for the victory. SOPAC Cal Storm 2016 Shootout Monsoon Division champs. In this division we saw the emergence of the OC Elite. After a close call in the opening round, they came out and dominated their side of the bracket. They were pushed to the limits by a very tough WCP and then dispatched a very good ihoops team to set up a match up with the host team. On the other side of the bracket, the host team, Cal Storm 16 handled early opponents with strong execution and precision. In the Semifinal, they were in a tough match up with Game Point and survived to create the matchup between them and OC elite. In the final, it was a pitched battle and OC elite preserved to secure a 5-point win, icing the game with free throws. Games in this division were hotly contested and many close games to thrill those in attendance. This division was dominated by two teams. While there were several teams that were very good, these two teams really separated themselves from everybody else. Those two teams were the Harvard Westlake Wolverines and Open Gym Premier Black. After making their way through the opening rounds, the two titans of the division met in the final. It was the game to watch of the division as the two teams like boxers squared off trading buckets and the two teams did not fall to deliver as they treated fans to an epic match. The Harvard Westlake Wolverines were able to hold off and claimed the title 53-45. A great game by two very good teams. The tsunami division saw 6 very evenly matched teams squared off in epic contests right down to the last game. The hotly contested games of this division was exemplified by the 3rd place game when the OC Dream outlasted High Desert Stars. A tightly fought 3-point game with the High Desert stars having a chance to tie with a shot that just rimmed out. In the championship game, the host Cal Storm 15 national team outlasted a tough and skilled WCP 15 National team. The contest between the teams was highlighted by the pressure defense of the Cal Storm National team, combined with the strong inside play of Kim Villalobos, the tournament MVP, and Lexi Whitfield. WCP 15 national team hung tough and this will be a battle that will be one to watch for years to come. The hosts, Cal Storm 15 U National team, outlasted WCP by a score of 46-40. Now for the titans of the tournament. This division had several Nike EYBL hopefuls. This group was led Cal Storm Team Taurasi and WCP Black. These two titans were expected to square off in the final for what would be a tune up for the National Tournament at the end of July. These two teams performed as expected but there were several teams that drew interest. The Triple S warriors were a team that should be watched in the future. A young team that performed well. After losing at the buzzer to the WCP Red, they made it to the Consolation final only to fall to a strong OC Elite 17 team. Considering that most of the players on the Triple S warriors are incoming freshmen and soon to be Sophomores, it was a great showing. In the final the two juggernauts faced off and in this round the pressure and non-stop fast breaking style led to a Team Taurasi win 35-18. These two programs will continue to wage their pitched battle in tournaments to come and proved that they are two of the top programs in the state. The tournament was a great event for the fans as the teams were evenly matched for the most part and they saw some great teams as well as the emergence of some great young talent that will thrill coaches and fans in years to come. This event will continue to grow and it is one that should be watched as it highlights young rising stars. See you next year.